Starling Marte is very much like AJ Pollock in that he has moderate pop in his bat and he has excellent base-stealing speed. Unlike Pollock, however, Starling Marte is in a lineup without a cleanup hitter, and the Pirates think that Marte could be the answer. Andrew McCutchen is a #3 hitter... plus, he's Andrew McCutchen, so he gets to do what he wants. Starling Marte, however, is just 27 years old, and he plays second fiddle to Cutch in the historical lore of the Pittsburgh Pirates. Marte is another one of those guys who does it all: hits for power, carries an above-average batting average, he scores runs, he drives in RBIs, and he steals a bunch of bases. But will that change if the Pirates need to move him to the cleanup spot? And if it changes, will it change him for better or worse? More importantly to you, will it change his fantasy baseball value for your team in a negative or a positive way? Starling Marte's speed is so valuable, but the Pirates may also need his power to hit cleanup in 2016. *Age 27 and coming of of three straight years of progressive improvement in Home Runs. We expect a continued uptick to the 20-25 range. *Two straight seasons with 30 SB. If he hits in the 2-spot, he'll end up with 25-35 steals. If he's in the cleanup spot, he'll end up around 20-ish. *Also fewer strikeouts in more games. He's becoming a better contact hitter over time, despite the lack of patience. If Marte ends up in the cleanup spot, we doubt he'll go all power-swing crazy and start trying to blast home runs. Professional hitters know that's a sure-fire way to more strikeouts, pop-ups and choppers to the mound.Plus, he already strikes out plenty, but check this out: last season, Marte actually cut his strikeouts down from 0.97 times per game to 0.80 times per game - and he did it while hitting more home runs per game on average. That's not something he's going to be willing to screw up just because the Pirates throw him in the cleanup role. If Marte hits in the 2-spot: expect 90+ Runs, 20+ HR and 25-35 stolen bases, all while maintaining a .285-.300 average. 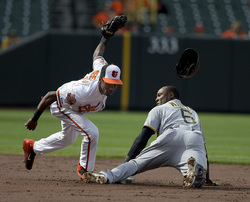 If Marte hits in the cleanup spot: expect 80+ Runs, 25 HR and 90+ RBI, but he'll end up closer to 18-20 stolen bases. His average will probably end up around the .275-.290 range. Watch the Pirates and Marte in Spring Training. If he excels in games where he hit in the cleanup spot, expect he'll stay there in the regular season. However, if he struggles in the cleanup spot, expect him to stick in the #2 spot and then you'll see a repeat of last year's stats, possibly with a few more Home Runs.